We are loving our one-year subscription to Drive Thru History Adventures. I’m so excited to share this review with you. 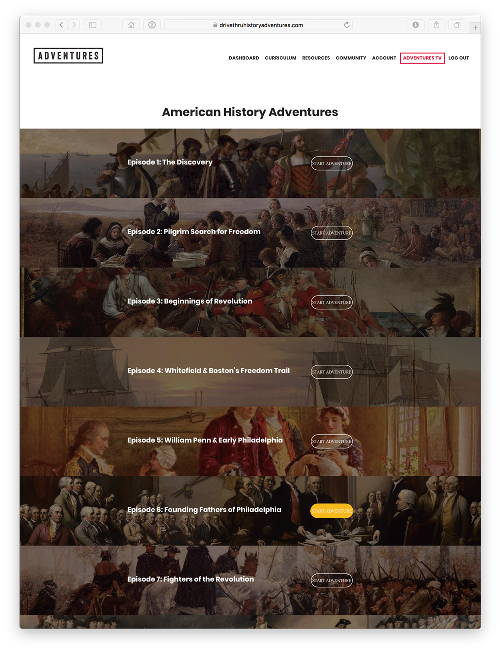 Drive Thru History Adventures has curricula for American History, Ancient History, and Bible History, but for this review we tried to focus on starting with the Drive Thru History American History Curriculum. I say tried because my son enjoys them so much that he keeps wanting to watch the videos on the other topics. 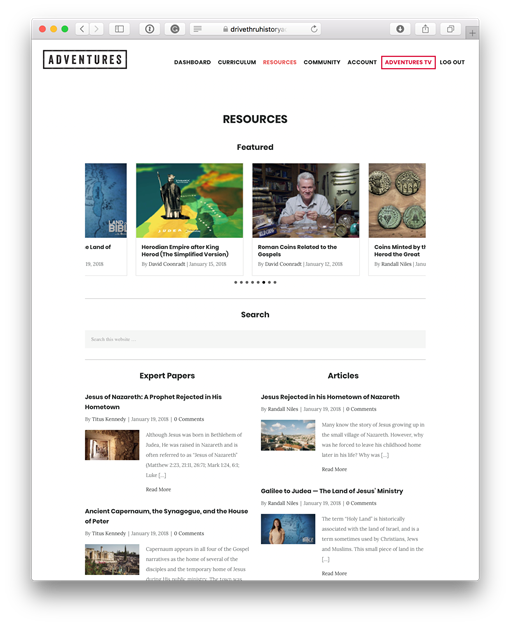 You can see all the videos available in the Adventures TV section of the website. We are in the middle of a two-year study of American history, so these videos on American History were a nice mostly-post-review for us. I think we could have used them during our year of study, or as a preview, if we’d had them at the time. My oldest child is 10 years old and in 5th grade, so he’s on the young side for this curriculum, but he loved it. 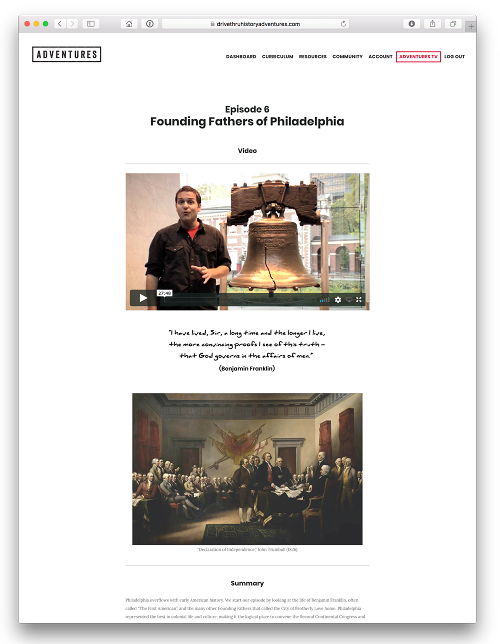 The history adventures curricula include a video and resources to go with it. The resources include primary sources (I like that a lot – too much of history is lost when it’s filtered through the lens of a textbook). There are classical art pieces to look at, questions to discuss, worksheets, answer guides, and suggested topics for what we call “rabbit trails” and Drive Thru History labels “Side Road” and “Dig Deeper.” It’s what I would call open-ended. The video content is really good, interesting and unique. It includes a lot of the juicier anecdotes that make historical stories more interesting. My ten-year-old was very interested in them, and he’s not shy about letting me know when history videos are boring. I haven’t found anything comparable anywhere on the internet or in my library. These videos made history really came alive for my son in a way that it hadn’t from our study of many books and free videos. The videos are filmed on location (the ones we watched) – this impressed my son a lot. The production value is excellent. Because they’re on location, the videos are kind of like a mix of a travel vacation video and a history video. I’ll use an example from the American History Curriculum we’ve been going through: Episode 9 Founding Fathers of Virginia. This video included virtual field trips to the homes of Washington, Jefferson, and Madison, and a quick drive-by of the Michie Tavern (see what I mean about how it’s kind of like watching a travel video mixed with a history video?). We took a weeklong field trip last year that included trips to Washington’s Mount Vernon home and Thomas Jefferson’s Monticello home. We weren’t able to get to James Madison’s home or the Michie Tavern, so we were glad to see those on the video. Before we left on our trip, I watched many videos with the kids to try to prepare them for what they would see. I thought I did a pretty good job, using free resources from YouTube and the websites devoted to these homes. We had guided tours at the homes, too, and my kids are not shy about asking questions. It turns out that even with all my research and our tours, we had still missed a lot. We both learned so much more about the homes after watching this episode! If you’re planning a field trip, I’m not sure whether it’s better to watch these videos before or after traveling and reading about these places and eras in history. Maybe it’s best to watch them both before and after. We were rushed through the tours quickly at these locations and missed a lot of items that the video covered. My son really liked seeing the host on location at the same places we’d visited, and he also liked seeing the host on location at places where we didn’t get to go. My ten-year-old says that he liked the videos a lot and that they were very good. He says the videos are some of the best history videos that he’s ever seen. Because he’s only 10, his main use of this curriculum was watching the videos, and talking to me about what he’d seen. As I mentioned before, you can see all the videos in Adventures TV. We all enjoyed the weekly Dave’s Adventure videos. They’re about 5-15 minutes long and they cover various topics. The last one we watched started off with Alexander Fleming and Penicillin. The video intertwines Fleming’s discovery with his Christian beliefs and ties it in with topics of today. Kids can ask questions on the Member’s Only Facebook Group and Dave might answer their questions in the weekly update, so one kid’s question brought up the Underground Railroad, another one brought up some Bible book history, another the Appian Way, and another brought up gladiators. These types of talks helped keep my son in the “learning by living” kind of mode. You don’t have to be assigned a certain topic to learn about it – kids should be open to having their curiosity sparked by things or people around them, and they should learn the tools to teach themselves about topics that interest them. The weekly videos help with the social aspect of schooling, too, because he can connect with other people who are studying the same things. Right now, Drive Thru History Adventures is offering 20% for readers of The Old Schoolhouse® Magazine. Look on Page 19 of this digital issue of The Old Schoolhouse® Magazine to find the coupon. AND there is another goodie (it looks like it can’t be combined with any other offers) – Right now Drive Thru History Adventures is offering a set of the The Gospels DVD to those who join with an annual subscription.